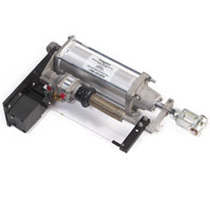 Pneumatic positioners are used throughout every facet of industry to control dampers, louvers, valves, and other mechanical equipment requiring movement as part of its operation. The simple design of these devices makes them a suitable choice for rugged applications and those requiring dependable performance. There are two basic types of pneumatic power positioners, thrust and torque. The thrust type has a powered arm with linear motion driven in both directions by air pressure and a piston. Torque type units utilize a similar drive mechanism, but have additional mechanical linkages that convert the piston thrust into rotational movement of a powered arm. The positioners generally consist of a pilot valve assembly, calibration spring, piston, and necessary mechanical linkages. There are two air connections to the postioner, control air and power air. The power air provides force on the piston, control air regulates power air. Increasing control air pressure on the pilot valve assembly causes the pilot valve to direct power air pressure to the drive mechanism (the piston) and change its position. A spring provides feedback force to the pilot valve assembly, resulting in a blockage of the control air signal when the mechanism reaches a predictable position. For any given control signal pressure, the piston will be positioned at a known distance from its fully retracted stance. Overall, the position of the piston is proportional to the control signal pressure. The pilot valve assembly can direct power air to either the bottom or top of the piston, providing powered movement in both directions. The device provides accurate and rapid positioning across its entire range of motion, with connected dampers or other equipment driven in a similar manner. There is also an on-off version that employs solenoid valves and electric control signals. This version, while not requiring the control air pressure signal, provides only fully extended or fully retracted positions. Though small in size, this thrust type positioner can handle weight loads up to 175 pounds (79 kg). Larger, more powerful, units are available, along with a host of options, to accommodate a broad array of industrial processes and commercial applications. Power positioners that convert the thrust of the piston into rotational motion are also common. An overview and description of the Rosemount Analytical pneumatic power positioners is provided below. Share your mechanical positioning challenges and requirements with application specialists. Combining your process knowledge with their product expertise will yield the best solutions. Rosemount Analytical Hagan Pneumatic Power Positioners from Hile Controls of Alabama, Inc.